The finished picture makes a great piece of artwork for a child’s bedroom. 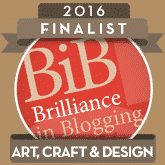 – they just blend together easily and the colours are really vibrant. 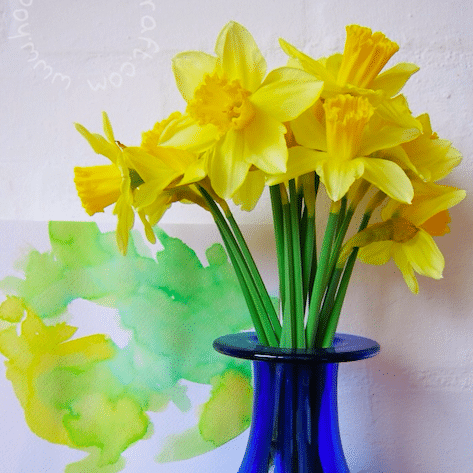 Take a piece of watercolour paper and paint it with 2 or 3 liquid watercolours. Cover the whole paper, leaving no gaps. You could also use some extra water to help the colours mingle (this was Pickle’s favourite bit). 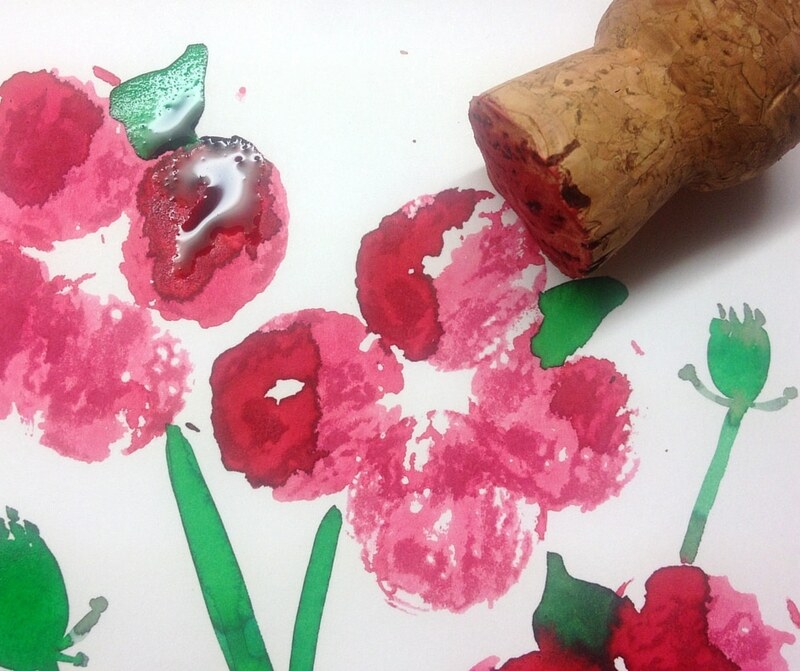 Leave the paper to dry completely (nap time is perfect for this)! 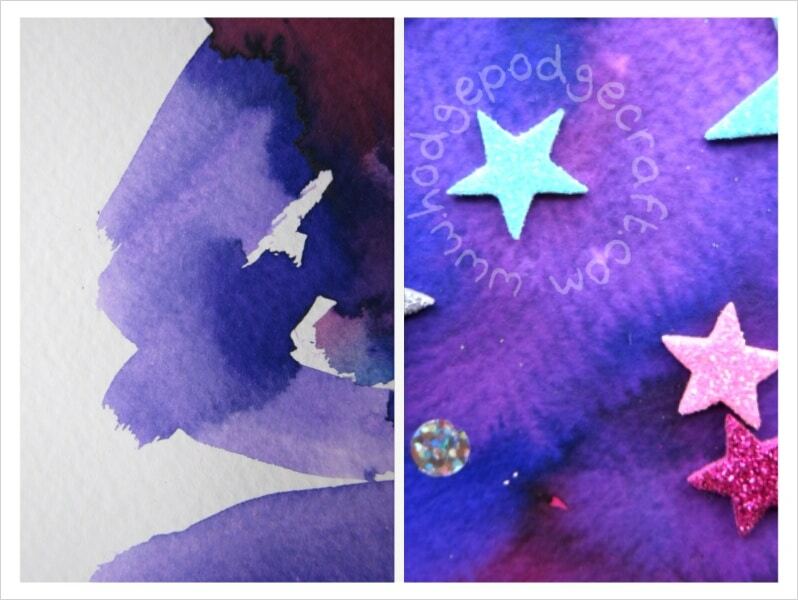 Stick lots of sparkly stars and dots on your paper to make a ‘galaxy’. 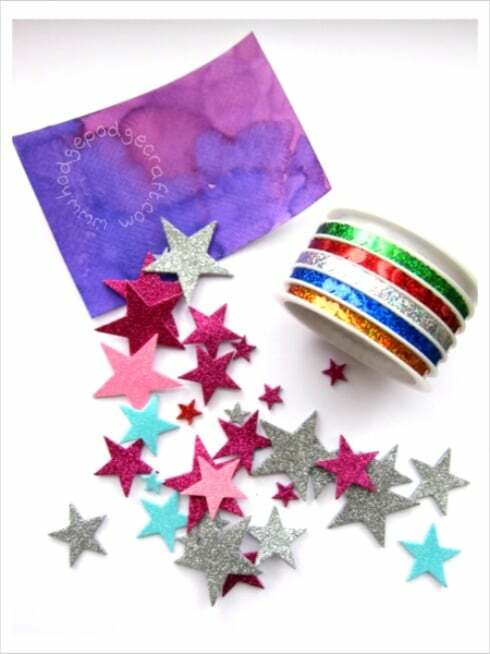 Chops loved peeling the backing paper off and sticking the stars on top of each other. 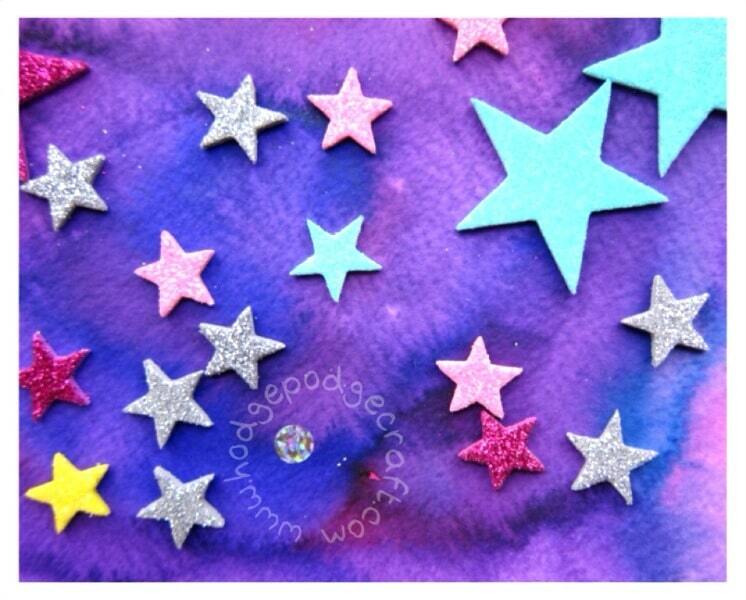 Older kids could stick their stars/dots to form constellations. You could use this to make a birthday card, or frame it and hang it on the wall! Are your kids interested in astronomy? 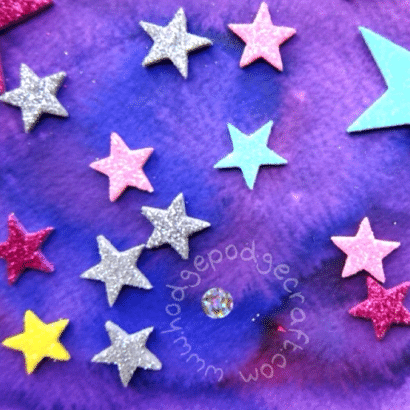 Have you done any space-themed crafts together? Do please share below! I’m going to have to get brave and buy paint! Kara – the great thing about watercolour is that it washes off and cleans up REALLY easily! Ooh that is so pretty, and doesnt cound too complicated either- which is good, as I am hopeless! That looks really impressive- simple, fun and brilliant results. 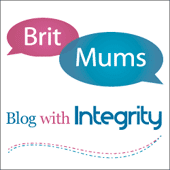 Thanks Kate – simple is usually best with my little ones! I find with really little ones, it’s far more about the process than the end result. Having said that, Pickle was very proud of his finished picture and it is still in pride of place on the staircase! These look gorgeous. 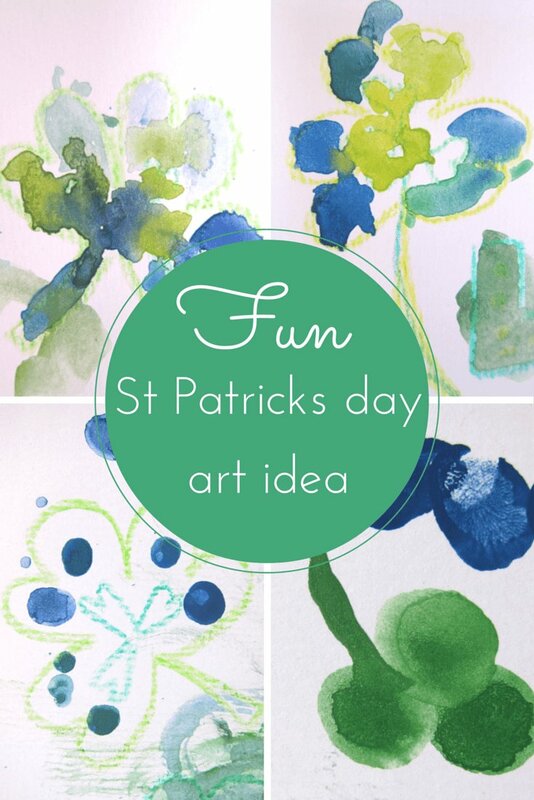 We will be doing start theme over next few weeks to link with a book I’ve got for a giveaway, so may have a go at this if I can find liquid watercolours! This looks amazing! … and so simple! Love it! My daughter is into arts and crafts! She’s 11! Nice idea! Kitty is obsessed with stars so this is right up her street! I love stars too – you can’t have too many IMO! They are SO easy to use. Definitely my best buy recently! 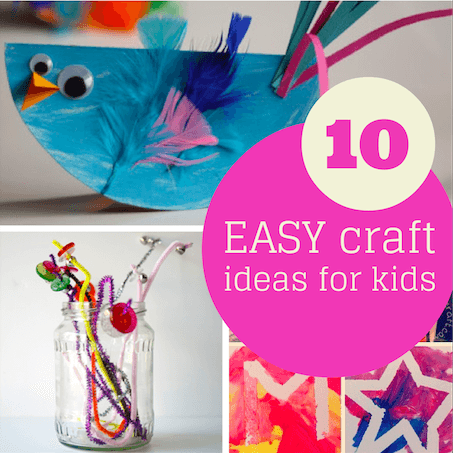 I have just started to do crafts with my toddler so we will be trying this one. Her Daddy is in to astronomy, he is much cleverer than me! Aaaw – maybe he could teach her the constellations..? I love watercolours, so easy to use and they wash out (of clothes) easily. I love the colours you have used, great end result. 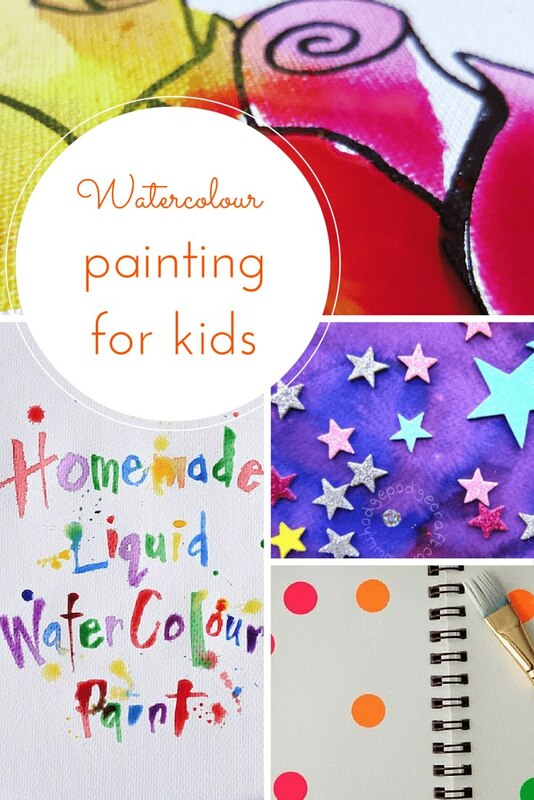 I’ve never tried watercolours with the children before but this looks fun! It IS fun Jenny – couldn’t be easier either! these are really pretty, such a lovely idea! I like the fact that it is fairly quick… our kids get bored sometimes even before they finish the project. These look great! 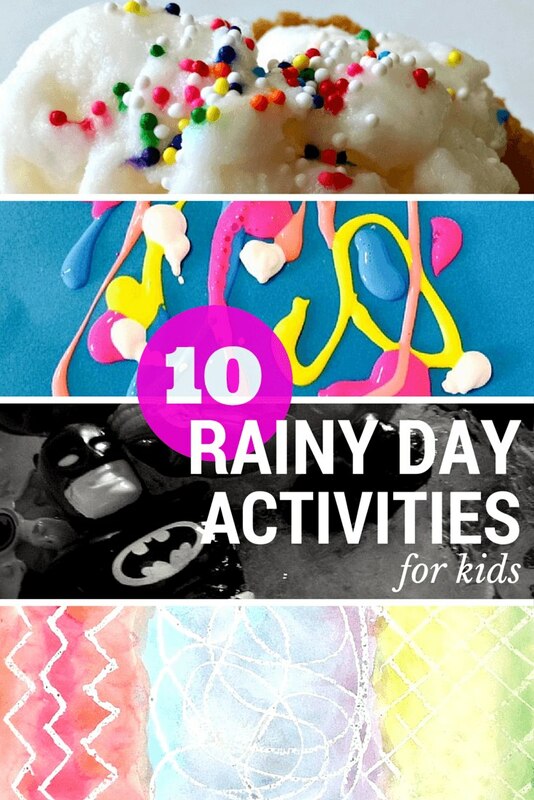 It can be difficult to find activities to occupy the kids and this is a really fun and simply craft to keep their creative minds flowing, and cheap too! What a beautiful idea! My friend’s just had a baby – this will be perfect for making her a card from my two. This looks so pretty! It’s perfect to hang up on the wall too. 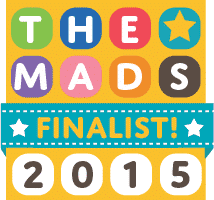 Thank you Tarana – I would love to do a huge one for the boy’s bedroom – great idea! Love this ideas! So pretty!